I never thought much about gloves until I started preparing. At the most I had a pair of rubber gloves for washing dishes. Now I have several types. Disposable gloves can be used for quick and dirty jobs such as cleaning up messes, pet waste, handling contaminated surfaces to avoid infection etc. However these are generally very flimsy. Thankfully, they are not very expensive. I got a 10 pack at the 99 Cents Only store, but a box from the warehouse store would be a better deal. If you do not want to run the risk of the gloves tearing, you’ll want a pair of heavy duty rubber gloves. Use these for larger jobs such as hauling trash, burying waste, etc. You can purchase these at any grocery or discount store. The first time we went camping, I didn’t even think about bringing work gloves. Mr. Apt. Prepper brought his and I saw how the gloves protect your hands from injury when picking up branches and chopping wood. –I never had to worry about getting splinters and minor cuts. –Keep your hands warm as the day grows colder. –Protection from heat as you tend the campfire. In the aftermath of a natural disaster or emergency, such as a hurricane or earthquake, you may have to pick up fallen branches, gather firewood, sift through broken glass and other heavy duty chores that will require protection from your hands. Do yourself a favor and pick up a couple of sets for each member of the family. 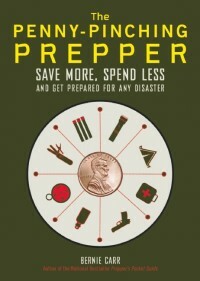 You can keep one pair with the emergency supplies and one in the bug out bag. Tactical gloves with hard knuckles are also a useful, light weight alternative to brass knuckles in a pinch. Esp. where even non-lethal weapons like brass knuckles are banned. 1. Hello….those mens gloves are temp unavailable. got any others you like?? 2. IMO hard knucle gloves might get you arrested — not worth the risk. Hi Bill, Oh now, they sold out! This one works well: http://ow.ly/OsYSd Also, “rigger’s gloves” are suppose to be durable, but I have not tried them. Thanks for letting me know the link is sold out. I appreciate that. I will swap out the link. I think gloves are one of the things that are often overlooked. We have been stocking up on them because they are so important. An alternative to tactical gloves or regular work gloves are mechanics gloves. They offer good protection and allow you to use small tools. If you do car repair it’s good to add a box of the blue nitrile gloves just to keep your hands clean. These allow you to handle tools unlike the big yellow gloves for scrubbing.